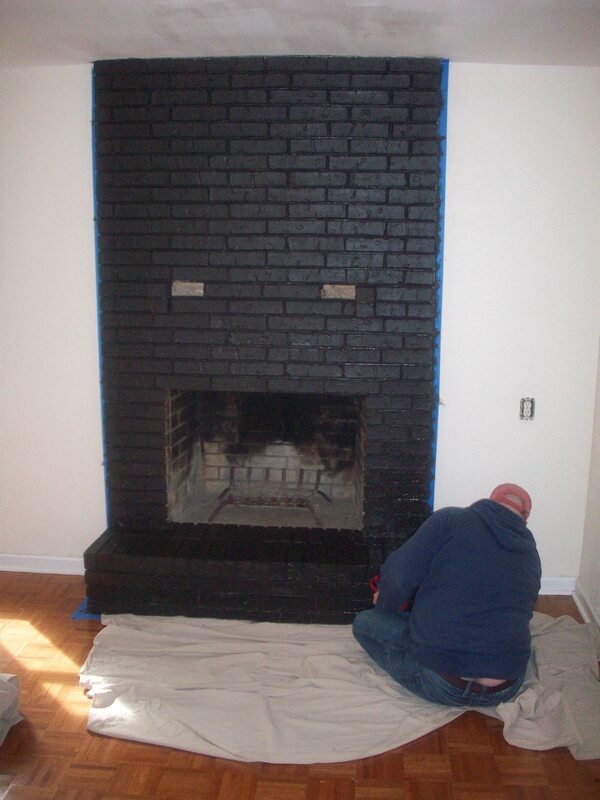 A lot of people have been asking about our brick fireplace lately. No, it wasn’t black when we moved in. In fact, it was some badly painted pea-green color. See? 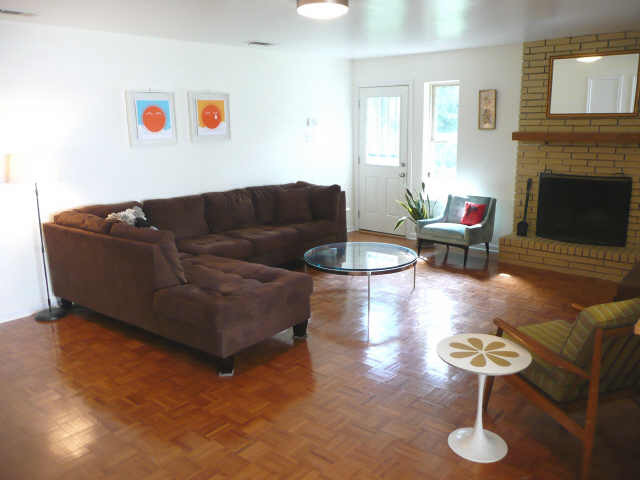 Here’s what the den looked like with the previous owner’s stuff. 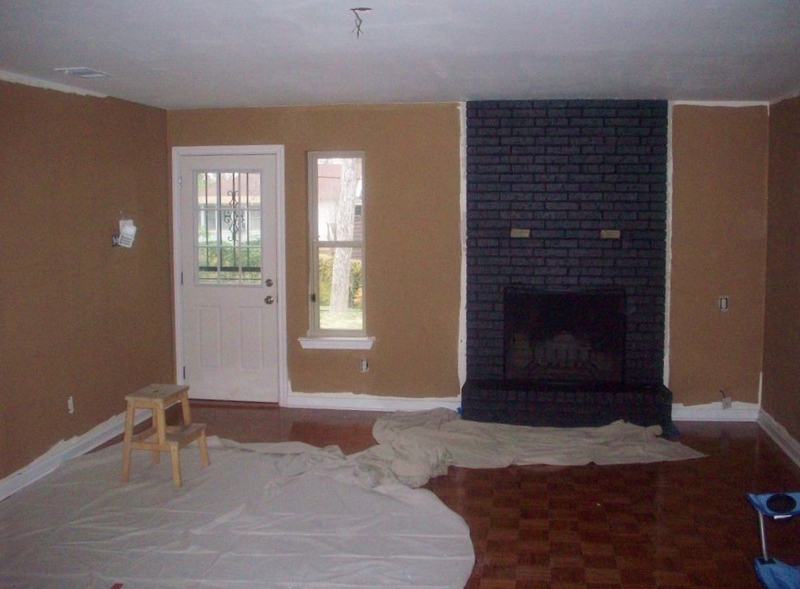 Could that brick fireplace possibly be any uglier? 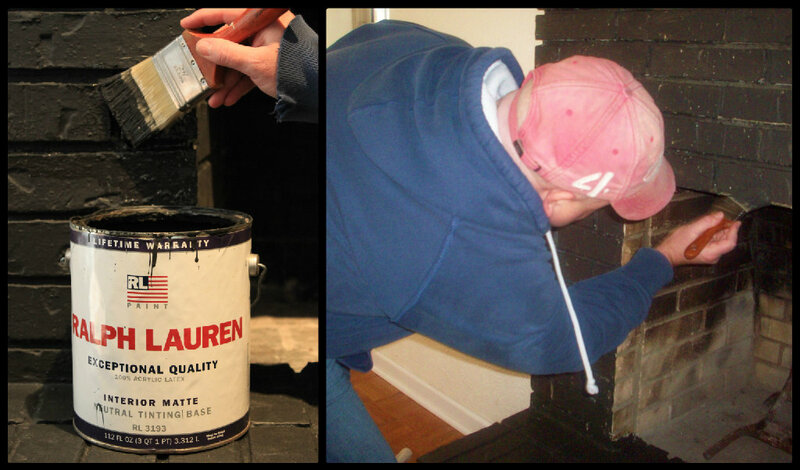 While I painted the ceilings flat white (they were all GLOSS antique white), Jamie went to town on the fireplace. 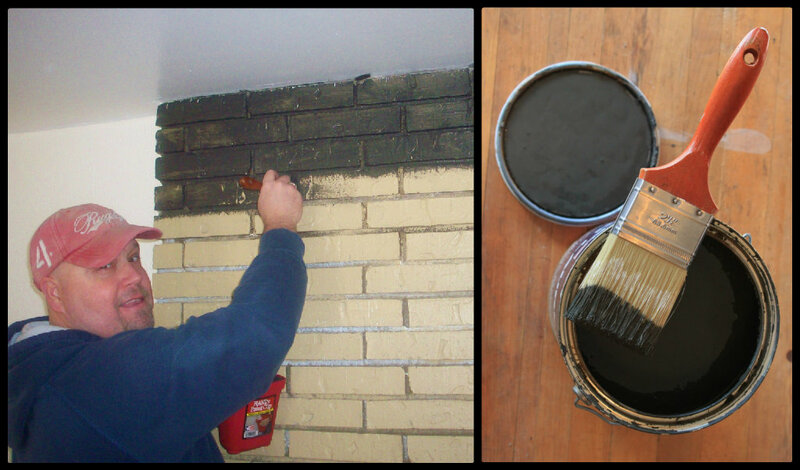 He started with a couple of coats of Kilz primer, tinted black. Because we wanted to do the ultimate paint job, Jamie gave it several thick coats, squeezing into all the groves and crevices. Then he added 2 good coats of Ralph Lauren “Granite”. Just plain interior flat latex paint. The inside of the firebox he sprayed with heat-resistant flat black spray paint……because we plan on burning things in there. They set off the black brick perfectly. The rolling log holder we made from plumbing pipe in an afternoon. There’s a tutorial located here if you care to make your own version. …or maybe just see how we did it. 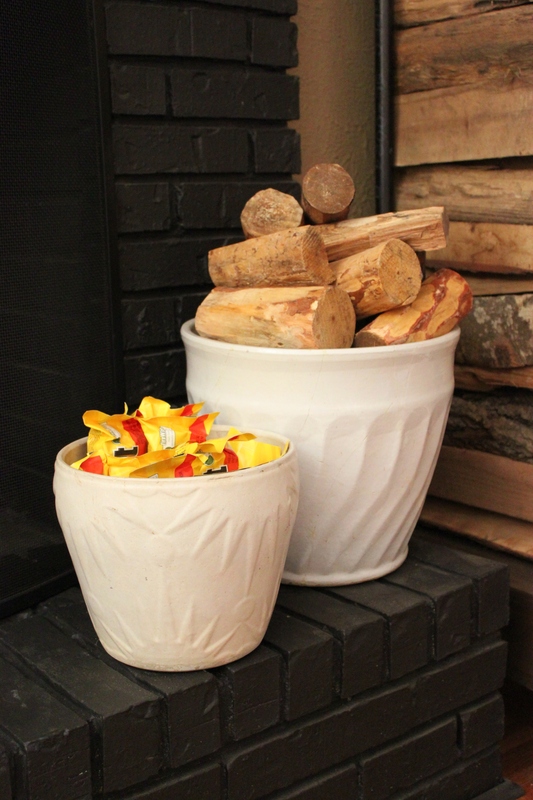 The vintage flower pots keep firestarters and sweet-smelling Pinon wood close at hand. We think it’s Way. More, Much Better……. We painted ours this summer–orange! (The bricks had been painted beige, and the grout was painted brown. Not exactly lovely.) And, yeah: Lots of paint. It took much longer than we thought it would, but we’re really glad we did it. Yours looks great! I would have been afraid to go with something so strong, but I love how it looks. Wow….Way Better!! So much cool going on that mantel too. Love your black fireplace. It makes such a statement! After seeing yours, I did the same thing to ours and we love it! Fireplace looks great. 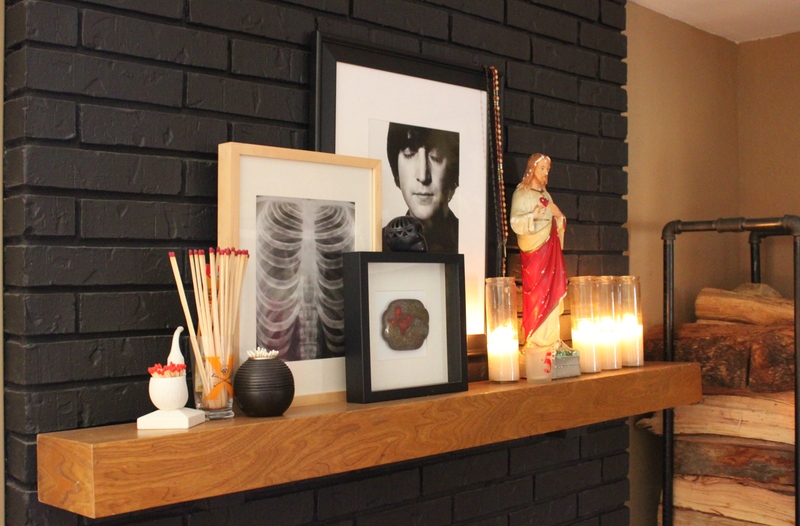 Have you told us before why you have a framed x-ray in your mantel arrangement? Just curious! 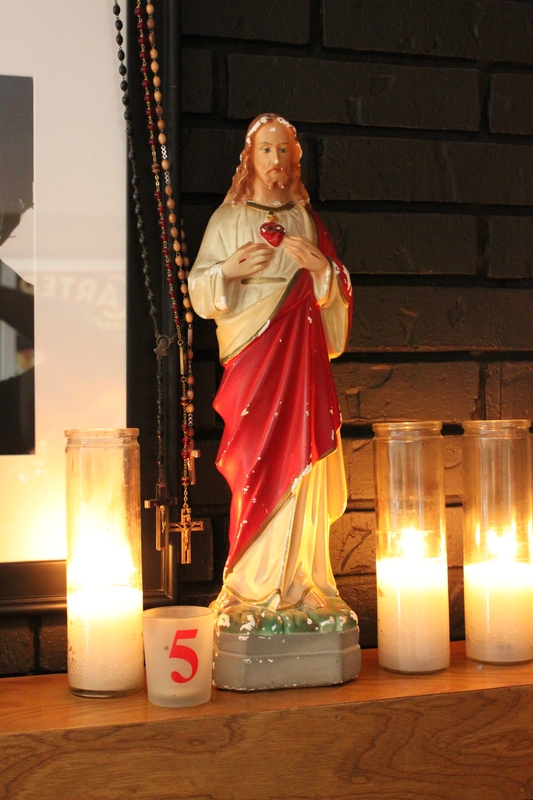 I like unusual finds to incorporate into my decor, too. Maybe I should frame my husband’s total hip x-rays. No. They’re not artistic-looking at all with that piece of metal taking center stage! Beautiful fireplace, a beautiful room! Love it all. Looks great. You have beautiful logs! It looks so cozy! 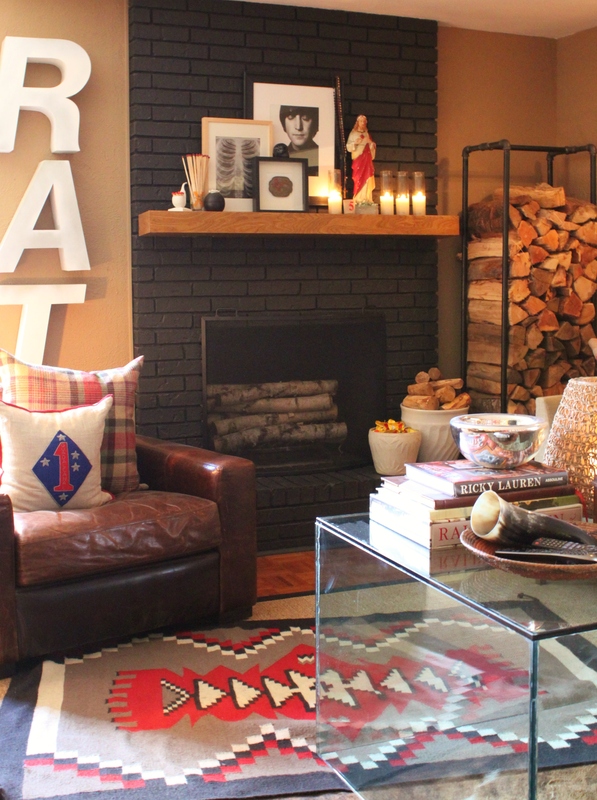 Really gorgeous fireplace and mantel, I love the mix of elements. my walls are a yellow toned beige. I painted my almost identical pink (!) 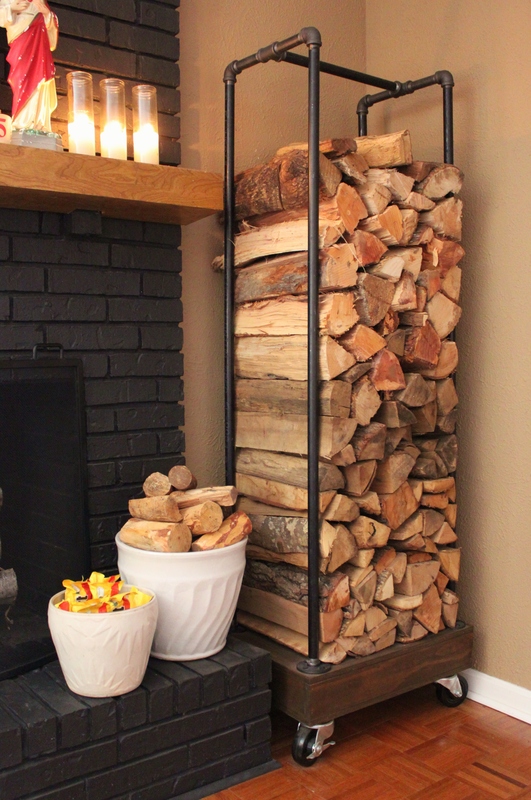 fireplace white and while it looks ok – what do you think about it being black? I guess I could always repaint it. Suzanne, we thought the same thing. 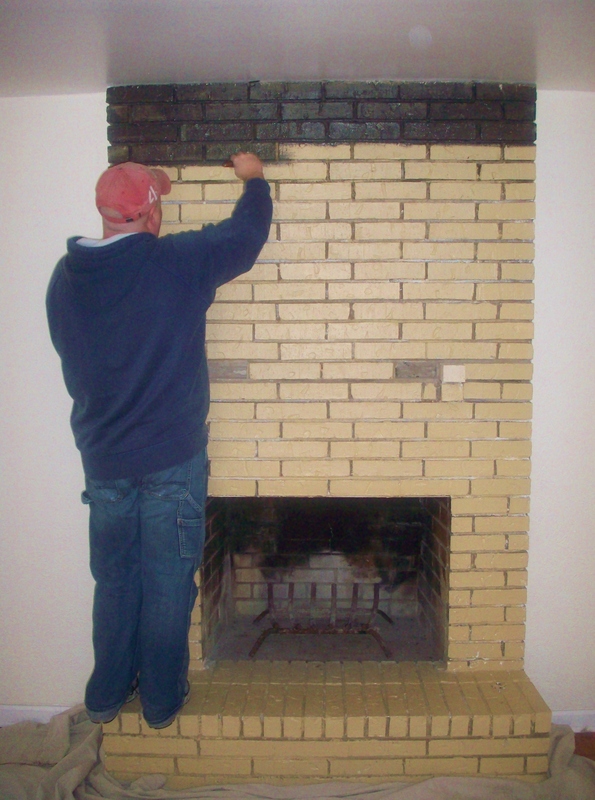 The fireplace was painted so badly to begin with…we could always paint it a lighter color if we didn’t like the black..But know what? We just LOVE the balck.